The starting point for a piece of knitted fabric is called the cast on. 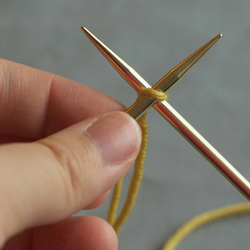 You can’t knit until you have cast on, so grab some needles and yarn, and cast on now! There are many different cast on methods (each with different properties), but we will start with the ‘knitted on’ cast on method first. Links to other methods can be found here. Knitted fabric is formed of a series of loops (called stitches). 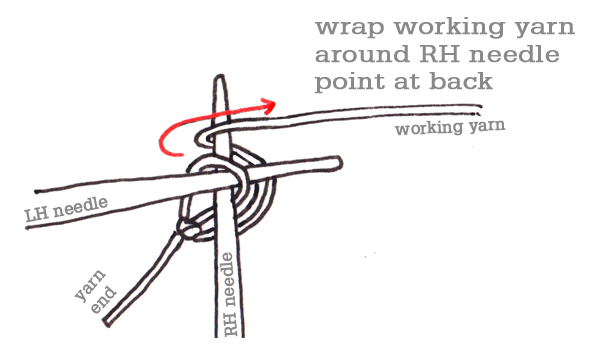 To start casting on, make a slip knot as your first stitch. 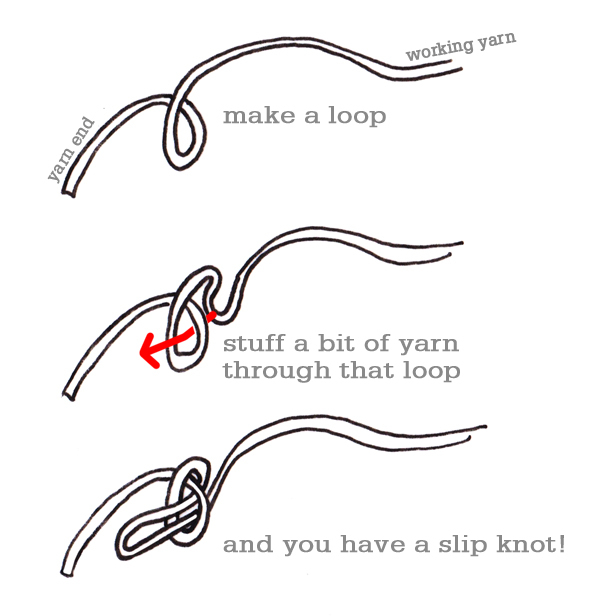 1. make a loop in the end of the yarn. 2. push another loop of yarn through that loop. 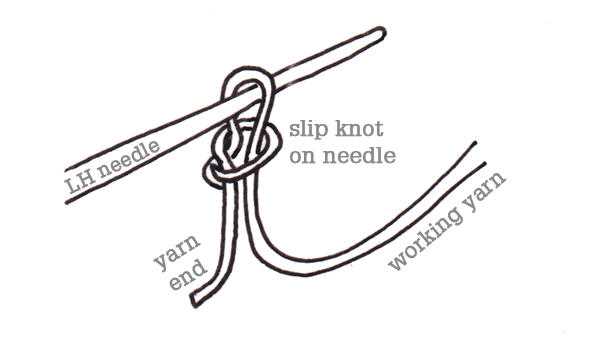 3. voila – you have a slip knot. Place the loop it on the needle. 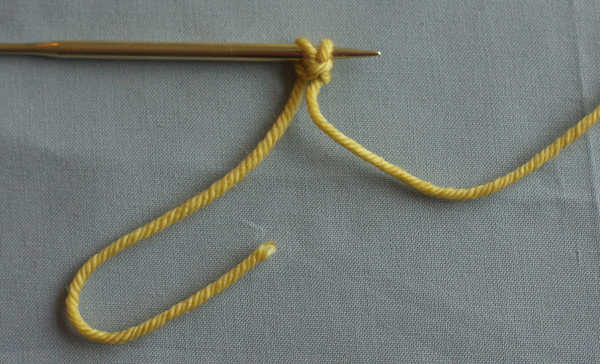 Now that you have your first stitch on the needle, hold the needle in your left hand (LH needle) and take a look at it. 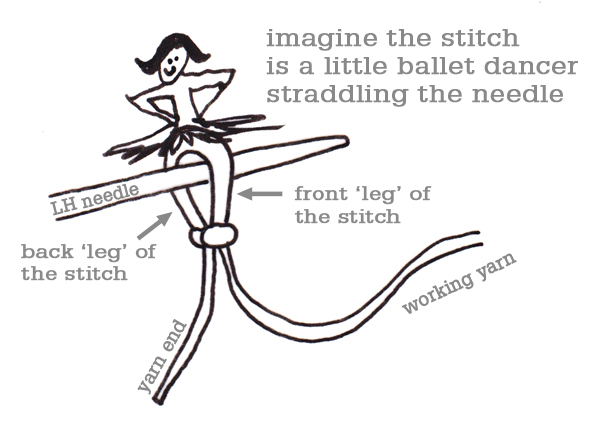 The stitch has two ‘legs’ – one in the front of the needle, and one at the back. 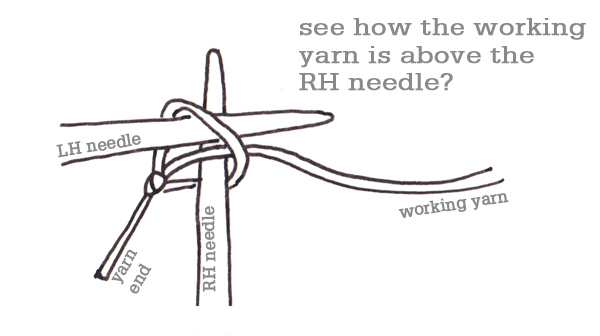 From now on, whenever you knit (or purl) you will begin by inserting the right hand knitting needle (RH needle) in between the front and back leg of the stitch. 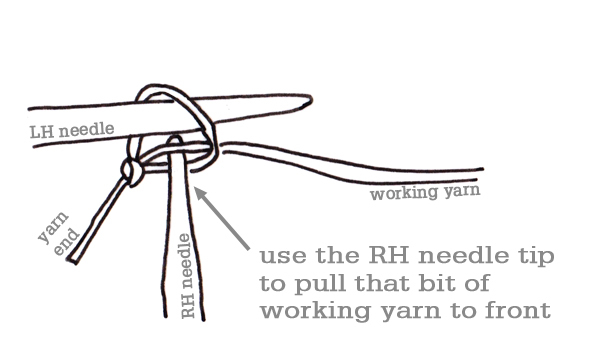 3. use the RH needle tip to pull a loop of the working yarn out from back to front, through the first stitch. 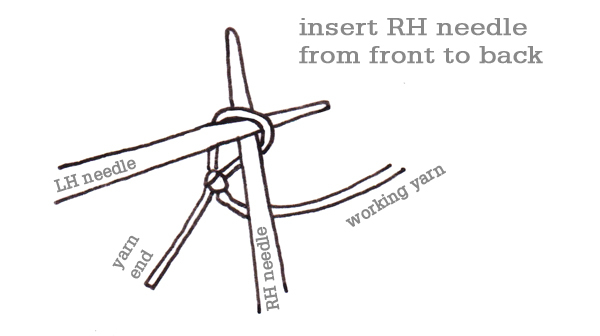 4. place this new loop on the LH needle. You now have 1 more stitch on the needles (2 total). Simply continue to repeat steps 1-4 (always working into the last stitch you placed on the LH needle) until you have the desired number of stitches. How do you know how many stitches you have? 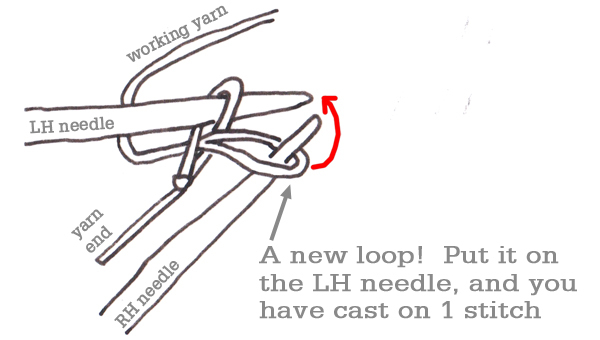 Easy – just count the number of loops on your LH needle. The slipknot you made first counts as a stitch. TENSION: Don’t pull tightly on the new loop after placing it on the LH needle, or the stitch will be too tight for you to insert your needle into it when you knit the next row. You will be able to tell if you cast on too tightly, because you will find it awkward when attempting to knit the next row – in this case start again with a looser cast-on. KNITTING FRIENDS: Sometimes casting on can seem like the most complicated part of a knitting project. If you can’t get it, just find a friend to cast on for you. After a little practice at knitting, casting on will seem much simpler! Don’t know any knitting friends? Well, you should! Generous and welcoming knit groups exist in most places, and are a great place to learn knitting and meet new people. Just google “knit group Vancouver” and see what pops up! Are you ready to start a project, and practice casting on? We suggest starting with the Wheat Scarf, or the Malt blanket. These are the first two designs from The Simple Collection, a free step-by-step learn to knit program. Each beginner pattern is explained by tutorials (like this one), and you can share them with your friends, or if you are a teacher, you can use them in your classes! 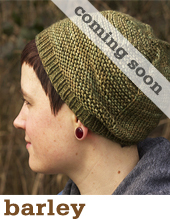 If you get our email updates, we can let you know when new free patterns and tutorials are released! Do you teach knitting? For Simple Collection PDF handouts for knitting teachers, click here. 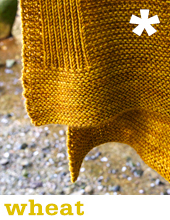 First time knitting a top down garment (Lush) and I’m wondering what technique you use for the underarm cast on when separating sleeves from the body? Thanks. Would a leftie just mirror this? I’m kinda ambidextrous, but I already crochet left-handed. Thanks! I just started the Easy Peasy hat pattern and have finished both ear flaps. I’m not sure how to cast on at this point since I already have stitches on my circular needle. Sherry are you using the same yarn to make the malt blanket? If so where did you purchase it? 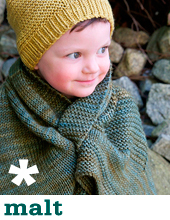 Where can I buy the yarn to make the baby blanket entitled Malt?